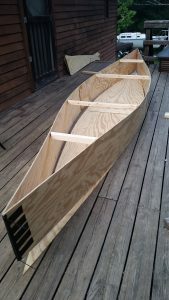 We had an amazing time today, after finishing the canoe yesterday! As an added bonus, we didn’t sink!! Confidence-builder for sure. 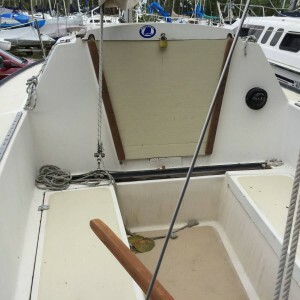 Tomorrow, time to remove any temporary screws, flip ‘er over, shape the skegs, and start filling screw holes, and epoxy sealing. Or maybe I should cut the grass, or clean the kitchen? Nah…. 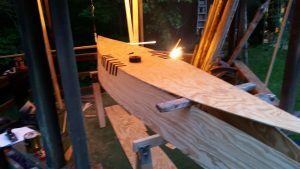 Quick Canoe Update – Georgia Pacific! Here she is with ALMOST all the parts dry-fitted if not already glued. 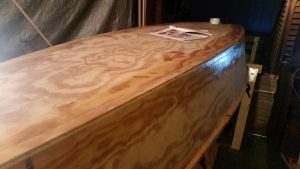 Two nights ago I completed the epoxy fillets on the inside of the hull – effectively permanently gluing the ply in place. 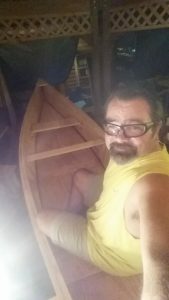 Yesterday, after the fillets were good and cured, I flipped the canoe over. I took all the duct tape, screws, and finishing nails out/off. I then used the plane to cut any overhang of the bottom-side joint down. 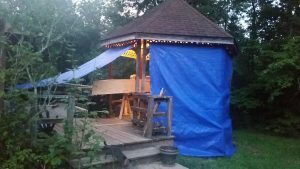 Then I spent most of the rest of the time yesterday, hanging tarp “walls” so I can work in the rain. It isn’t raining yet, but it will be by the weekend! Tonight, I got the chines and stems glass/epoxy taped. Finished the epoxy fillets tonight. For you lilly-livered landlubbers, that means the main part of the boat is glued together for good (I hope)! 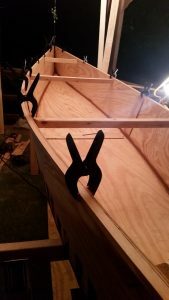 Behold, a Quick Canoe being born! After some issues with failing duct tape, and failing buttstraps (don’t ask!) 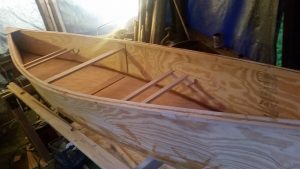 We have a 3-D Canoe shape! 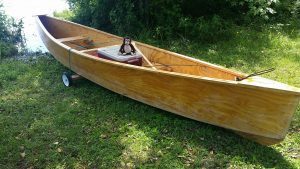 Since we have decided to sell Eeyore (the Montego 20 that we keep at Sarasota Sailing Squadron), we’ve had a logistical problem. 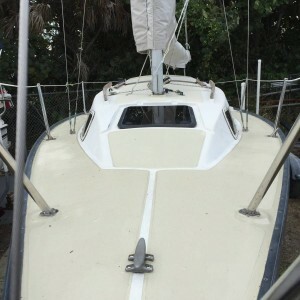 We want to upgrade to a little larger boat, especially for when the kids are with us sailing. 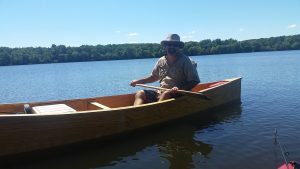 The Balboa 24 fits that bill – but it’s in Missouri. Worse, it’s on a very nice painted steel trailer, that I REALLY don’t want to introduce to salt water. 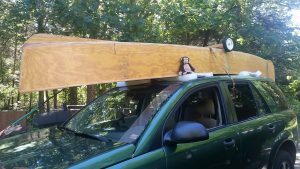 So, we were facing the prospect of finding a galvanized trailer for the Balboa, and hauling it to Florida. 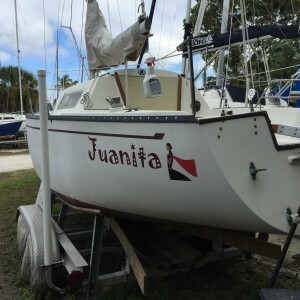 Juanita is a 1978 San Juan 23, on a nice I-beam dual axle galvanized trailer. She showed up on Craigslist at a price we couldn’t refuse. Best of all – she’s ALREADY at the SSS! More pictures, etc… to come. We are excited! Please click on the short video below. Fair winds! For a larger version of the video, click the arrow in the upper right corner. The morning, before Sharon hooked the giant Tarpon, she caught a small catfish, but we threw it back. The Tarpon taking all the line made that the last of the fishing! Our companion boat going north in the ICW (I forget the name now) stuck with us through several bridges. 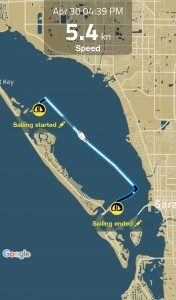 At one point they strayed outside the channel, and went aground. I steered towards them to see what was going on, and the captain said over the VHF “I’m on the ground, man, don’t follow me!”. They managed to get off under their own power, luckily. On our sail in the Gulf, south to Boca Grand pass, we were blessed to see a sea turtle swimming close to the boat. That was a treat! Hopefully Sharon will remember anything I’ve left out. Thanks for visiting! !